We invite you to explore India - the Land with infinite beauty ! Whether you soar high into Himalayas or peer under the ruins of the Ancient monuments dotting the landscape of India, you will cherish the experience long after your visit ! This India Travel Guide on Spiti Valley is free from any commercial interest! This site is dedicated to promote India - the vast subcontinent, its glorious past, magnificent landscape and its infinite variety. Located between Tibet and India, Spiti is a valley nestled amongst the majestic Himalayas. Situated at an average height of around 12500 feet above mean sea level, Spiti lies along the Himalayan river of the same name. This is the home to ancient civilizations and it is untainted by modernity. The unmatched physical beauty of Spiti attracts travelers from all over. The hospitality found in the Spiti villages is infectious and it is little wonder that trekkers love Spiti with its comfortable home and friendly faces. The culture of Spiti is predominantly Buddhist. Though sparsely populated, Spiti is a gateway to the northernmost regions of India. Surrounded by high mountain ranges, like the Rohtang Pass at 3979m, Kunzum Pass at 4590m which cuts off Spiti from the Kulu valley, Spiti has snowfalls for almost eight months in a year. It is so cold that the south route to India is closed for brief periods in the winter season. Literally tucked away from civilization, Spiti valley is almost surreal, like a desert mountain surrounded by the rugged Himalayas. Spiti trek is very popular. Surrounded by Himalayas and by Kulu valley, Ladakh and Tibet, with its low valleys, Jeep Safari and Spiti Safari are arranged from Kulu Valley, Manali to Spiti Valley in the Himalayas. The journey normally begins from Delhi to Manali and then to the village Naggar which houses a famous Russian Roench's gallery. Then to the Langaza village which has a unique temple regarded as the headquarters of Gods and Goddesses. The trek moves on to Dhanakar, to the spectacular blue green lake amidst pink and brown hills. Further on, Giu is an isolated village and then on to Spiti. Giu village is interesting as it has the body of an old priest sitting in mediation, for a few hundred years now. Some of the popular trails in Spiti are Pin-Parvati, Parang-La and Pin Bhaba. Kunzum Pass which is the gateway to Spiti leads to Bara-Sigri the second largest glacier in the world. Spiti valley is accessible throughout the year via Kashmir from Shimla. The border of Spiti starts from Samdo which is quite close to the Indo-China border. In summer, Spiti can be reached via Manali through Rohtang and Kunjum pass. However, due to its high elevation, travelers are likely to develop altitude sickness in Spiti. Yet another interesting aspect of Spiti is its river. She originates from Kungum range and Tegpo and Kabzian streams are its tributaries. Water draining which is an important part of the Spiti river system drains the famous Pin Valley area. Due to its position across the main Himalayan range, it is deprived of the benefit of southwest monsoons. Spiti River attains peak discharge in summer months due to melting of glaciers. The Spiti river flows through the valley and thereupon meets Satluj at Namgia in Kinnaur district and then flows from the north western direction to the south west in the Pradesh. Huge mountains border Spiti River with its numerous tributaries. These mountains are barren with no vegetarians and the main settlements along this river are Hansi and Dhankar Gompa. Trip to Spiti becomes unique due to endeavors that promote carbon neutral in these areas. Travelers invest in renewable energy options such as solar houses, green houses, solar water heating systems and cookers, wind energy alternatives and artificial glaciers. Cultural performances at Spiti are a travelers' delight. The cultural programme entails a traditional dance by local troupes. These usually are nomadic monks and members of the heritage conservation councils. There are two traditional dance forms in Spiti - the Bhuzen and the Chham. The Bhuzen dance is performed by wandering Lamas in the Spiti valley only. This dance is indeed a fantastic display of martial artistry and includes acrobatics, swordplay and the smashing of stones on the Bhuzen's stomach. The second one is Chham which is also popularly known as the devil's dance. Popular in Spiti and Lahaul, this dance is performed on auspicious days. The movements of this dance are slow and circular in motion. The dance is accompanied by the beat of drums, cymbals and long pipes. Spiti is otherwise called 'Little Tibet' as it has the same terrain, vegetation and climate, almost. The river Spiti gorges some places with its fast flow. In some parts of the Spiti valley people grow barley, buck wheat and peas and vegetables. The people here are simple and honest. Local farmers eke out a living on the small trip of greenery that hugs the banks of Spiti River. Spiti is also the place for motorcyclists and mountain bikers. Divided from the fertile Lahaul valley, by the Kunzum La, Spiti hosts Buddhist monasteries, and villages have few houses dotting along the arid valley floor. There are excellent outlets in Keylong to purchase carpets and local pure wool Kullu shawls, lois, baby shawls, mufflers, stoles and ponchos. Caps and other Kullu handloom are also available. Readymade garments made of Merino wool and Angoora and Pashmina grass and bedroom slippers are found here. In Spiti, a home stay accommodation typically includes other than the warm Spitian hospitality, a clean room with a clean bed, candles and lamps and eco-friendly toilet. You can sample local cuisine. A few government guest houses are also available at Kaza, Tabo, Losar, Samd, Poh and Sagna at Spiti. The eating options are limited at Spiti although Indian and Tibetan foods are available in and around Kaza. There are ethnic restaurants that specialize in Tibetan foods and native dishes. 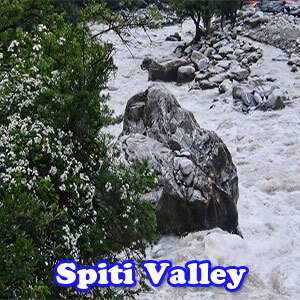 The weather at Spiti is pleasant and quite comfortable during summers; from May to October. Although it seldom rains, the mercury level does not exceed 30 degree and never falls below 15 degree. Enjoy bright sunshine in the lush valley. In monsoon, due to absence of rains the climate is dry and invigorating. It snows heavily in winter. In summer it is recommended to wear jacket and a woolen cap. Days are warm to hot and the high altitude tends to have a strong sun, and therefore carrying sunscreen is important. It is better to wear full sleeved clothing to avoid the risk of sunburns. During winter heavy woolens are mandatory as the average annual snowfall is about 7 feet. The best time to visit Spiti is during the summer months from June to October. Major festivals are held at Spiti during the months of June to August. Hence this would be a good time to visit and partake of the festivities in this wondrous land of yore.